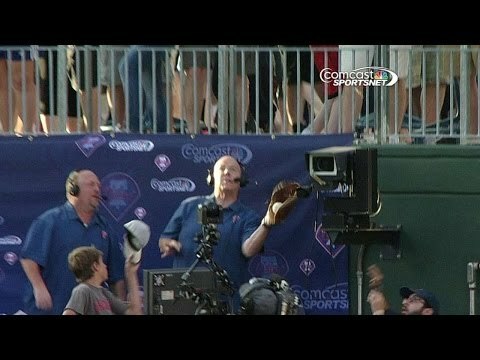 PHILADELPHIA — Play-by-play man Tom McCarthy was the only Phillies announcer who brought his glove with him for a special broadcast from the center-field stands Friday night. Good thing he did, because it sure came in handy. McCarthy simultaneously called and caught Freddie Freeman's three-run homer for the Atlanta Braves in a 4-2 victory over Philadelphia. "It was just really cool. The most unimaginable thing that could happen," McCarthy said. "It was a remarkable sequence of events. The biggest thing is, I was trying to call the play. Then I said, 'Please don't drop it.'" McCarthy was broadcasting the game from center field along with analysts Matt Stairs and Jamie Moyer, both former Phillies. While neither Stairs nor Moyer brought a mitt, McCarthy had one that he uses to play catch with his two teenage boys. "Just jokingly brought it out, more for show than anything," he said. "There's no way I would've caught it without the glove." Moyer threw his arms in the air after the grab. Then he and Stairs encouraged McCarthy to follow a Citizens Bank Park tradition in tossing the opponent's home run ball back onto the field. McCarthy threw it back, making sure, he said, to avoid hitting center fielder Ben Revere. The announcer received congratulatory text messages from his boys and their friends. "They thought it was awesome," he said. Freeman went deep in the first inning and Julio Teheran (7-5) struck out nine to hold a struggling Phillies lineup in check. "I felt good out there. I just wanted to get ahead in the counts and make my pitches. That's my mentality," Teheran said. The right-hander allowed two runs — one earned — and six hits in seven innings. He walked none and retired his final seven batters for Atlanta, which had lost six of 10 beginning with Philadelphia's three-game sweep at Turner Field last week. "We knew that getting four in the first couple innings, that would probably be enough, the way he pitches," said Freeman, who also doubled and drove in all four Atlanta runs. "He goes out there and shuts down hitters every single time he goes out." Craig Kimbrel pitched a scoreless ninth for his 23rd save in 27 chances. Revere had three hits, including a triple, for the Phillies, who have lost five of seven. The Braves jumped on Kyle Kendrick in the first inning thanks to Freeman's three-run drive. Freeman's RBI double in the second boosted Atlanta's lead to 4-0 before Kendrick settled down. "This shows how he can carry a ballclub," Braves manager Fredi Gonzalez said. Kendrick (3-8) tossed a season-best eight innings, giving up four runs and nine hits with eight strikeouts and two walks. "If it's a strike, I'll swing," Freeman said. "I'm not a guy who's going to let a strike go by. So I just swung and got lucky, connected a couple times." But the early damage was too much to overcome for Philadelphia's sagging offense, which entered ranked 11th in the NL in batting average at .241. The Phillies scored three runs or fewer for the 39th time this season and dropped to 7-32 in those games. Philadelphia manager Ryne Sandberg said winning without consistent offense is tough. "That can be difficult," he said. "The guys are grinding it. We're giving ourselves some opportunities, not as many tonight." The Phillies scored twice in the fourth on Jimmy Rollins' RBI groundout and Marlon Byrd's RBI single. They threatened in the eighth against reliever Jordan Walden, placing runners on first and second with two outs, but Walden fanned Ryan Howard on a 97 mph fastball to end the inning. "We just couldn't get the big hit," Sandberg said. Philadelphia put a runner in scoring position in the ninth. Byrd drew a leadoff walk, but Kimbrel struck out Cody Asche before John Mayberry Jr. flied out to the wall in left-center. Domonic Brown, out of the starting lineup for the second straight day and third time in five games, struck out as a pinch-hitter to end the game. Gerald Laird replaced Evan Gattis behind the plate for the Braves after the top of the first. Gattis struck out swinging in the first and left the game due to back spasms. Laird went 1 for 3 with a double. Gattis said afterward he would have a better idea of the extent of the injury on Saturday. NOTES: Philadelphia placed catcher Carlos Ruiz on the seven-day DL with concussion-like symptoms. Ruiz was hit in the head by A.J. Ramos' pitch Thursday against Miami. ... The teams play a day-night doubleheader Saturday, with Atlanta RHP Ervin Santana (5-5, 4.15 ERA) facing RHP Roberto Hernandez (3-6, 4.41) in the opener, followed by RHP David Hale (3-2, 2.72) against Philadelphia RHP Sean O'Sullivan in the nightcap. O'Sullivan will be making his first start of the season after getting called up from Triple-A Lehigh Valley. ... The Phillies recalled right-hander Luis Garcia from Triple-A Lehigh Valley after the game.